WWP’s physical health and wellness programs play an important role in helping warriors maintain positive mental health. 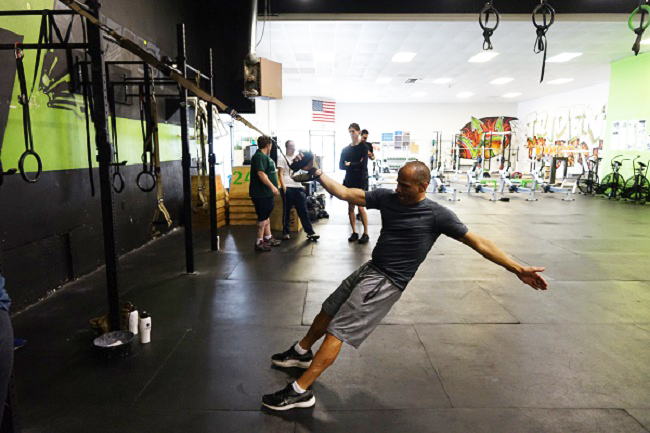 SEATTLE (June 28, 2017) – One of the major challenges many wounded veterans face when returning to civilian life is maintaining a healthy and active lifestyle. That’s why Wounded Warrior Project® (WWP) hosts physical health and wellness expos around the nation, not just to get warriors moving again but to connect them with other local warriors who share their life experiences. WWP’s physical health and wellness programs play an important role in helping warriors maintain positive mental health. In a WWP survey of the injured warriors it serves, 29.6 percent of survey respondents expressed physical activity helps them cope with stress and emotional concerns. At the expo in Seattle, warriors were challenged to use their own body weight for resistance training with TRX workout straps. TRX, or total-body resistance exercise, is an increasingly popular workout method invented by a U.S. Navy SEAL. The exercises were difficult, but doable, because they were specifically designed to accommodate injuries. Warriors also learned modifications for home workouts. When the event was over, warriors walked away with a bigger fitness toolbox than when they arrived – but also new friends that they can lean on in their community. To learn more about how WWP’s programs and services connect, serve, and empower wounded warriors, visit newsroom.woundedwarriorproject.org. To find photos from this event, click on multimedia, then images.